Bilal Tamimi detained after IOF stormed Nabi Saleh on 11 Feb; released after 12 hours. Israeli Occupation Forces invaded Nabi Saleh on Tuesday, 11 February. The IOF opened fire with teargas and rubber bullets. Bilal Tamimi was detained by the IOF after they stormed the village during the daylight hours. Bilal was detained for approximately 12 hours, with the Israeli occupation forces later releasing him after 2 am because they couldn’t find anything to charge him with. Video by Bilal Tamimi before he was arrested. *Nabi Saleh’s regular protest on 13 December was cancelled due to extremely bad weather. Two Palestinian women, Nariman Tamimi & Rana Nazzal who were arrested during a non-violent protest against Israel’s occupation in Nabi Saleh on Friday have appeared by the Israeli Occupation military court at Ofer today. 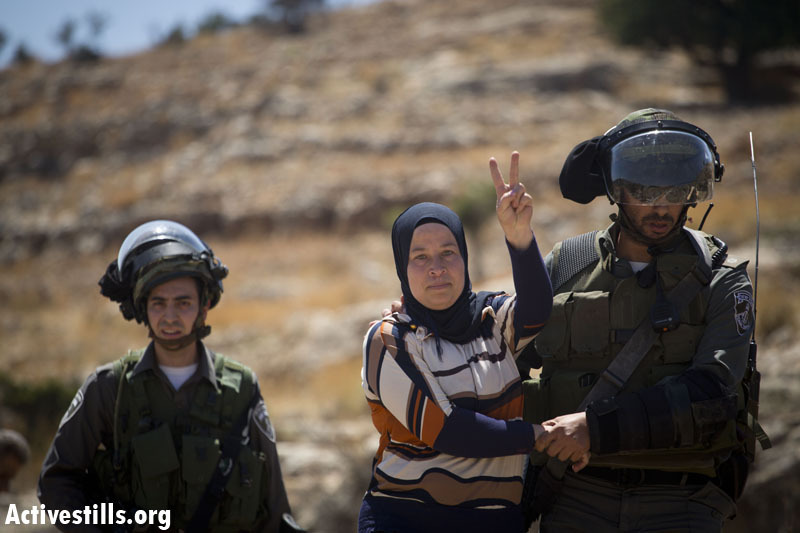 The military court ruled to release the two women activists, however, the Israeli military occupation police have appealed the decision. As a result, Nariman and Rania will be held in Israeli prison for a third night. The Spanish international activist, who was arrested at the same time as Nariman and Rana was released the same day as the arrest but has been banned from entering Nabi Saleh for 15 days. Bassam Tamimi returned to the West Bank village of Nabi Saleh this week after completing his ninth sentence in an Israeli jail. The Palestinian activist explains why he now believes in one state for all. Only the remains of a cream cake on the kitchen table and a few fluttering flags on the roof are testimony to the happy atmosphere in this home. However, the joy over Bassam Tamimi’s release from prison this week was considerably dampened by the grief over the death of his brother-in-law, Rushdi Tamimi. Rushdi, 31, died three months ago when Israel Defense Forces soldiers fired 80 live rounds at him − without any justification, according to a subsequent IDF investigation. The first thing Bassam did after his release was to visit Rushdi’s grave. 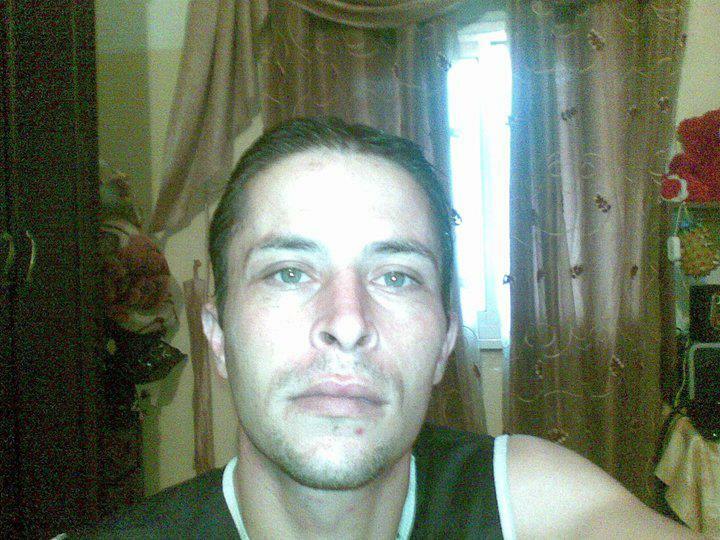 Bassam’s cousin, Mustafa Tamimi, was killed over a year ago, also by IDF gunfire. And soldiers did not hesitate to fire tear-gas canisters at his funeral, which I attended. Bassam’s sister, Bassama, was killed 10 years ago when she went to the military court in Ramallah, where Bassam was being remanded in custody. An army interpreter allegedly pushed her down a staircase; as a result, she broke her neck and died, leaving five young children behind. Photographs of the three hang in the family’s living room in Nabi Saleh, a determined village that is part of the popular Palestinian uprising. Bassam Tamimi, the leader of the uprising, was released this week after his ninth incarceration in an Israeli prison. The latest spell behind bars came after he participated in a nonviolent demonstration calling for the boycotting of Israeli products, held at the entrance to the Rami Levi supermarket in the Geva Binyamin industrial zone, southeast of Ramallah. This four-month sentence can be added to the other four years Tamimi has previously spent in Israeli prisons. In a poster that reads “Free Bassam Tamimi,” also hanging on one of the living room walls, there is no date. His wife, Nariman, explains that the absence of a date has enabled the poster to be used all the times he has been arrested. She herself has been arrested four times. For several years, Bassam, 45, has been trying to complete his requirements for a Master’s degree in economics. The problem is that, whenever he makes a little progress toward finishing the requirements, he is arrested and sent to prison. Now he is determined to get a Ph.D.
His village, in the Ramallah district, began its struggle in 2009, on the anniversary of the first intifada 22 years before. 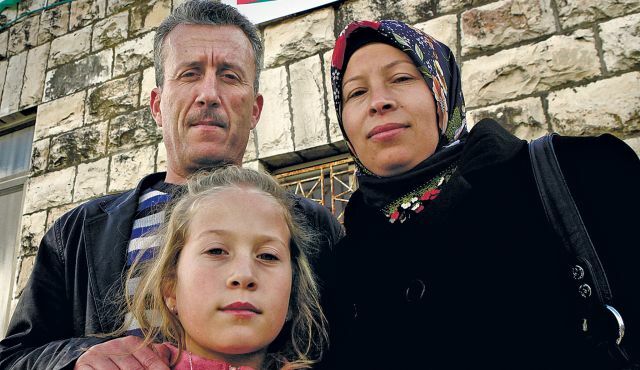 Tamimi and his friends from the village, as well as international and Israeli activists, wanted to return to the days of that first intifada, to protest the expulsion of villagers from Nabi Saleh’s well by settlers from the nearby settlement of Halamish ‏(previously called Neve Tzuf‏). Since that time, though, Tamimi has changed his outlook. Whereas previously he supported the two-states-for-two-nations idea, he is now fighting for the concept of a single state from the Jordan River to the Mediterranean Sea. This week, the day after his release from prison, Bassam explained his new worldview: “The seizure of the well is only a manifestation of the problem, not the problem itself. The same can be said about the checkpoints, the settlements, the theft of Palestinian lands and the arrests. The real problem is the occupation. “When the village of Budros succeeded in changing the route of the separation fence, this was a minor victory. The problem is the separation fence, not its route. The problem is not the settlers’ attacks, but rather the settlements themselves. The problem is the occupation, not its various manifestations. “When a representative of the American consulate visited here a short while after we began our struggle,” he adds, “I told her: ‘Let us say you were Wonder Woman and you could, simply with a toss of your head, make Halamish disappear. Would you solve the problem? Just look around you, at the settlements.’ We believe that our fate is not the occupation but rather the resistance. “Israel has killed the two-state solution. That is why we must adopt a new strategy, and find a new partner for that strategy in Israeli society. We must kill the occupation and the [sense of] separation in the Israeli consciousness: The separation of people from one another is a question of consciousness. We must never return to this failed pattern of thinking. The future will not change if we continue to think with the same concepts of the past. The solution is a single state. If we believe we have a right to this land and the Israelis believe they are the ones who have a right to this land, we must build a new model. If both of us believe that God gave us this land, we must put history aside and begin to think about the future in different terms. “I began to be active in the Fatah movement, which means that I supported its ideas,” Bassam says. “For me, as someone who never worked in Israel, the Israeli was the soldier who is shooting, the soldier who is at the checkpoint, or the investigator in prison who caused me to lose consciousness for ten days and to suffer partial paralysis in 1993 after he used considerable physical force while rocking my body during my interrogation. For me, the Israeli was the woman who killed my sister. This was the image of the Israeli in my view, and it made me hate Israelis. “However, when we began the popular uprising, I met other Israelis, people who believed that I have a right to this land, people who were partners and true cousins. This strengthened my belief that we can learn how to live together. I have no problem in suggesting to Jonathan Pollak [one of the anarchist leaders opposing the separation fence] that he build his house on my roof. But I cannot tolerate the idea that the settlers have settled on my land. My consciousness has changed and it has taken me to the one-state solution, which means the acceptance − not the removal − of the Other. In the past I wanted all of this land without any Israelis. Today, I also accept the Israelis. If we can all change our consciousness, we can create a just country. Tamimi’s daughter listens to our conversation. Ahed is a beautiful, blonde-haired young girl of 11 who made her worldwide media debut a few weeks ago when Turkish Prime Minister Recep Tayyip Erdogan invited her to visit Turkey, together with her mother. A large, elegant album with chrome paper pages − a gift from the Turkish government − displays breathtaking photos from the visit of Ahed and her mother, a visit that was given extensive media coverage. On returning from Turkey, Ahed told her father that, when Erdogan suggested she accompany him on a visit to a refugee camp for Syrian refugees, she turned down the offer. She told the Turkish prime minister that her heart already had enough pain. further to the right and that is the reason why it is hard to believe that we are getting closer to something substantial. Israel is pushing us back to the idea of the armed struggle in order to again spread the lie that we are terrorists. This worries me very much. “That means apartheid,” Tamimi continues. “This is Israel’s plan: to banish the Palestinians from all of Area C. For instance, my home is located in Area C and a demolition order has been issued against my home. Yes, you are now in Area C and you can feel secure because here Israel is responsible for security. Some of the houses in this village are in Area C. Half of my cousin’s house is located in Area B and the other half is located in Area C. Thirteen demolition orders have been issued against houses in this village. I have a building permit for part of my house from the Jordanian government; it was issued in 1964. “The Israelis have issued a demolition order for 300 square meters of my house, although my house measures only 200 square meters. Perhaps I can borrow 100 square meters from Halamish. Although perhaps they will not demolish my house, they have managed to scare me so much that I have decided not to add another floor. In other words, four of my children will have to move to Areas A and B. This is the quiet population transfer. This is ‘gentle’ genocide, where no one is killed. The next generation will leave Area C and only the elderly will remain. Perhaps they will be given Israeli identity cards, but that will be apartheid. “Because it is for the most part Zionist, the Israeli left wants to change the Palestinian consciousness and adapt it to the Israeli left’s consciousness. It is not prepared to accept our right to our consciousness. The Israeli left wants to change us. It wants to make life easier for us under the occupation, but does not really want to put it to an end. After all, ever since the Oslo era, the total area of land that the Israelis have taken from the Palestinians is five times the area of land that they took before Oslo. However, when I see who comes here every Friday in order to demonstrate with us and to support us in our struggle, I believe that we do have a partner for changing the situation. |Investigation finds no reason to use live ammunition in the November shooting death of Rushdie Tamimi, 31, in Nabi Saleh, in the West Bank. An IDF probe has concluded that in November, Israeli soldiers fired 80 bullets without justification causing the death of a Palestinian man shot in the back during clashes in the West Bank village of Nabi Saleh. Rushdie Tamimi, 31, was killed when a group of Palestinians in the village began throwing stones toward a road from a long distance, and an army reserve unit tried to disperse them. The army probe of the November 19 shooting in Nabi Saleh arrived at harsh conclusions regarding the conduct of the IDF company commander and the reserve unit called in to disperse the stone-throwers. While events were still unfolding, Channel 10 reported that the commander had been relieved of his duties following the shooting. The probe conducted by the army’s Central Command found that the commander had been driving in the vicinity when he saw some 10 youths throwing rocks from a hilltop. The probe determined that the youths were too far from the road to constitute any real danger. Nevertheless, the commander summoned about 10 reserve soldiers from a nearby army outpost and instructed them to disperse the youths. However, he neglected to report this immediately to battalion headquarters, which was only 50 meters away. Haaretz approached the IDF spokesman two days later for a response to the incident. The army investigation found that the soldiers had fired tear gas at the stone-throwers for an hour and a half. When they ran out of canisters, a medic was sent by jeep to the adjacent outpost to bring back some more. At that point, the commander instructed the soldiers to use live rounds. They fired 80 bullets, one of which hit Tamimi in the back. For several minutes, the soldiers prevented anyone from giving him medical aid, until they relented. Tamimi was evacuated to a hospital in Ramallah, where he died two days later. The commander claimed the soldiers had not noticed that anyone had been hit, which is why they prevented anyone from approaching Tamimi to provide medical aid. This seemed a dubious claim, though, since the victim was bleeding from the head. Nabi Saleh has been the scene of frequent weekend protests against settler incursions on villagers’ water supply. The stone-throwing that preceded Tamimi’s death took place during Operation Pillar of Defense in Gaza. The army sees the incident as a “failure of values,” and the Military Police’s investigation branch has opened a formal inquiry into the fatal shooting. On Tuesday, a 16-year-old Palestinian boy was shot to death by Israel Defense Forces soldiers in the West Bank village of Budrus, Palestinian sources said. Samir Awad was shot four times in the torso and legs, sources said. He is the fourth Palestinian killed by IDF fire in the last week. The incidents came a day after Israeli soldiers shot and killed a Palestinian man in the Gaza town of Beit Lahiya near the border with Israel. Gazan officials said Mustafa Abu Jarad, 21, was a farmer. He was taken to Shifa hospital, where doctors said he died from his wounds. The Israel-Gaza frontier has been mostly calm since November, when eight days of Palestinian rocket fire and Israeli air strikes killed 170 Palestinians and six Israelis.